Release dates for video games have becoming increasingly murky in recent years for a variety of reasons. Often a game comes out on one day but can be accessed a few days early if you pre-order, and different regions sometimes get new releases on different days. With Anthem, the upcoming RPG shooter from BioWare, things are even more complicated even without regional differences, prompting publisher EA to release a chart to both help you figure out when you can play and illustrating just how unusual the situation is. 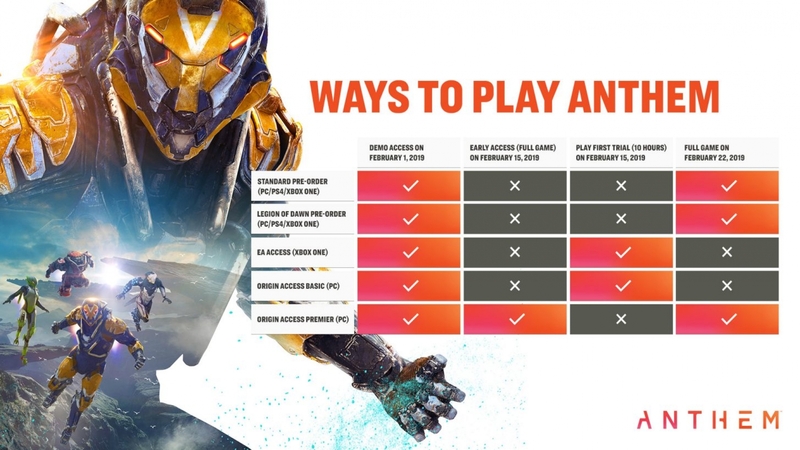 The problem is that you can obtain Anthem in multiple ways, including some options that don't involve directly purchasing it. Those on PC can get into the full game as early as February 15, provided you subscribe to Origin Access Premier--EA's pricey $15/£15 per month or $100/£90 per year service that gets you access to its new releases, among other things. If you're on Xbox One, you can also start playing Anthem on February 15, but only for 10 hours total; you can do this by subscribing to EA Access, letting you try a chunk of the game without buying it. If you're on PC and are a subscriber to the platform's EA Access equivalent, Origin Access, you also get 10 hours to play starting on February 15. Figuring out when you can start playing is just a matter of finding your path to the game in that chart, but it's nonetheless striking that a chart is needed for what should be a simple fact. Confusion aside, this might also prove frustrating for groups of friends looking to play together who are acquiring the full game at different times--or it might just drive users to subscribe to one of the Access services, which is likely what EA wants. Following the recent issue-plagued VIP demo, a second Anthem demo runs this weekend, from February 1-3. It features a variety of fixes, and there's a tease for some kind of special event toward the end of the demo on Sunday.